Repeated exposure to ultraviolet (UV) rays from sunlight results in cumulative detrimental effects on human skin. Ultraviolet B (UVB) radiation, which is a principal component of sunlight, results in oxidative damage to cellular components and a cascade of metabolic, enzymatic, and phenotypical alterations. The ultimate result of such UV exposure is genetic damage, induction of reactive oxygen species (ROS), and activation of signal transduction pathways related to growth, senescence, and connective tissue degradation1–4. Histopathological and clinical alterations resulting from photoaging, include visible skin changes, qualitative and quantitative alterations in dermal collagen, and the formation of dystrophic elastic fibers. Ageing populations glo bally are concerned about making clinical improvements to their ageing skin, and anti-ageing topical products are widely used for reversing some of the damage caused by solar radiation. A plethora of anti-ageing compounds have been topically used to combat skin photo-damaged by UV exposure5. The photodamage to dermal connective tissue has been explored in the hairless mouse (hm) model, and comprises of the accumulation of elastic fibers, loss of mature collagen, lowered expression of collagen I, increased levels of collagenase, changes in fibroblasts, mast cells, and increased levels of glycosaminoglycans6,7. The present study was an attempt to explore the redeeming effects of some commercial anti-ageing cosmeceuticals on damaged dermal morphology in the hm. The experimental mice were exposed to UV-B radiation to cause mild injury to the dermis, and the reparative effects of four topical agents on dermal structures of such skin were compared with histological analysis. Another group of irradiated animals radiated for 8 weeks was simply maintained without further treatment to observe the natural course of dermal regeneration following UV exposure (RADL: 8 weeks of UV + 5 weeks of maintenance). UV + retinoic acid (UVB/ra). Retinoic acid group (UVB/ra) treated with Renova (tretinoin cream 0.05%), Ortho Dermatological, Skillman, NJ. The dorsal skin of mice was exposed to UVB radiation from a band of four FS 20 UVB lamps (Daavlin, Research Radiator, Bryan, OH) equipped with an electronic controller to regulate UV dosage. The UV lamps emit UVB (280–320 nm with a peak emission at 314 nm), 20% UVA (320–375 nm), and a negligible UVC emission. Dose units can be entered as mJ/cm2, and the exposure is controlled using Daavlin Flex Control. The dosimeter was calibrated by engineers from the company before starting the experiment. UVB radiation was applied to the mice, which were freely moving in cages three times a week for 8 weeks. The amount of radiation was progressively increased from 30 mJ/cm2 per exposure at week 1 to 90 mJ/cm2 per exposure at week 8 (30, 60, 70, 80 mJ/cm2 for 4 weeks, 90 mJ/cm2 for another 4 weeks). Immunohistochemical staining for the identification of PCNA, collagen I, and fibroblasts as described below. Deparaffinized hydrated slides were subjected to antigen unmasking utilizing a 1x concentrated citrate retrieval solution, and then rinsed in phosphate-buffered saline (PBS) for 5 minutes. For the demonstration of Anti-Hsp47 (identification of fibroblasts), tissue sections were blocked with H202 Blocking Reagent for 30 minutes at room temperature. Slides were treated with a protein blocking solution for 10 minutes at room temperature then rinsed and incubated with monoclonal mouse anti-Hsp47 (Enzo Life Sciences ADI-SPA-470) antibody at titer of 1:50 for overnight at 4°C. Slides were rinsed, then treated with Anti-mouse HRP (Biocare Medical, Concord Ca, MM 620) for 30 minutes at room temperature. Anti-Hsp47 staining was detected with Betazoid DAB (Biocare Medical, Concord, CA) for 10 minutes. Slides were rinsed in distilled water, counterstained, and dehydrated through an alcohol gradient and mounted with micromount. For the demonstration of anti-collagen I, tissue sections were blocked with H202 Blocking Reagent for 30 minutes at room temperature. Slides were treated with a protein blocking solution for 10 minutes at room temperature then rinsed and incubated with monoclonal mouse anti-Collagen I (Abcam ab34710) antibody at titer of 1:100 overnight at 4°C. Slides were rinsed, then treated with Anti-Rabbit HRP (Biocare Medical, Concord Ca, RMR 622) for 20 minutes at room temperature. Anti-collagen I staining was detected using Betazoid DAB (Biocare Medical, Concord, CA) for 10 minutes. Slides were rinsed in distilled water, counter-stained, and dehydrated through an alcohol gradient and mounted with micromount. For detection of proliferating cell nuclear antigen (PCNA), de-paraffinized sections were pretreated with ethylenediaminetetraacetic acid for heat-induced epitope retrieval. Sections were treated with blocking solution provided in a commercially available staining kit (Zymed Laboratories, Inc., South San Francisco, CA) that uses a biotinylated PCNA monoclonal antibody, streptavidin-peroxidase as a signal generator, and diaminobenzidine as the chromogen. After reaction, the sections were lightly stained with hematoxylin, resulting in adequate contrast for counting. For measuring the thickness of the dermal regeneration zone (ratio of thickness of repair zone/thickness of total dermis) a calibrated ocular micrometer scale was used. This linear scale was also used for counting the dermal cysts (no. of cysts/linear scale). Mast cells were counted using a 45x objective lens and a 10x eyepiece fitted with a 5 x 5 square reticule (0.7 mm/side) with horizontal and vertical lines, and 10 fields were counted per section. These cells were counted from sections stained with resorcin-fuchsin, and Luna stain for studying elastic fibers. The same grid was used as an intersection point for counting elastic fibers8. This grid was also used for evaluating dermal cellularity from sections stained with hematoxylin-eosin-phloxine sequence, PCNA-positive cells of the dermis, and fibroblasts. PCNA positive nuclei were counted under high power (45x); nuclei with intense brown staining or sharply stained granules were considered positive for the immunoreactivity, and nuclei with diffuse and faint staining were disregarded9. For quantitative analysis of collagen I stain intensity immunostained sections were scanned with the Aperio Scan Scope VCS (Aperio Technologies, Inc., Vista CA) located in the Research Histology and Tissue Imaging Core at the University of Illinois in Chicago. Sections were analyzed using the Aperio Positive Pixel Count algorithm, which reports the mean intensity for the collagen stain. Quantitative data are expressed as means ± standard deviation. Statistical analysis was performed using SPSS ver. 20 (SPSS IBM, Chicago). One-way analysis of variance (ANOVA) for independent samples was completed on quantitative data to determine the overall significance between all seven groups. A value of P<0.05 was considered significant, and the F-ratio was determined. Table 1 contains a summary result of the F-ratio, the level of significance, and a grading of the relative effect of the treatments. All the quantitative data recorded from morphometric observations have been incorporated into Table 1. The repair zone ratio (relative width of repair zone/total dermis width) showed radiated animals had a reduction when compared to control values (mean control 0.50, RAD 0.35, RADL 0.41). Both antioxidant (UVB/ao) and retinoic acid (UVB/ra) brought it up to near control levels (0.49). Improvements were also noted following estrogen (UVB/est) and peptide (UVB/pept) treatments (0.47 and 0.42 respectively) [F 6.08, P 4.55E-05]. Figure 1 reveals a loss of collagen I staining intensity (Figure 1 A,B) in radiated skin especially in UV radiated animals maintained for 5 weeks (intensity values: C 130, RAD 124, RADL 87). Three topical treatments restored the intensity (UVB/ao 136, UVB/ra 134, and UVB/pept 132). Estrogen effect (UVB/est) was minimal with a value (125) similar to that in RAD animals (124). [F 33.90, P .000]. Fibroblast numbers from HSP-47 immunostained sections (Figure 2) showed a 50% reduction in skin samples collected at 8 weeks following UV radiation (C 87.24, RAD 41.78); the value somewhat recovered in the RADL group (52.0). UVB/ao and UVB/pept topical treatments brought up this number (UVB/ao 86.97, UVB/pept 84.89, UVB/ra 76.07, and UVB/est (73.99). [F 24.25, P .000]. Elastic fiber count (Figure 3) was higher in radiated skin (C 2.38, RAD 3.83, RADL 3.82). The proliferation was reversed with antioxidant (UVB/ao 2.3); the other three topicals augmented the percentage values of elastic fibers (UVB/ra 4.26, UVB/pept 4.52, and UVB/est 4.62). The numerically increased fibers were sometimes tangled without any appreciable change in thickness [F 15.93, P 7.2 E- 12]. Very high values in mast cell counts were recorded following radiation (C 2.47, RAD 4.80, and RADL 5.46). Topical treatments reduced this count to 1.76 (UVB/pept), 1.97 (UVB/ao), 3.17 (UVB/est), and 3.66 (UVB/ra) [F 50.49, P 9.46 E-20]. Dermal cellularity (Figure 4) was enhanced in radiated animals (C 37.16, RAD 46.37) but showed a lower value in RADL group (38.6). Estrogen (UVB/est) and peptide (UVB/pept) treatment groups had values similar to control animals (35.28 and 37.5 respectively) [F 2.47, P .003]. UVB/ao and UVB/ra groups showed somewhat lower values compared to RAD groups (41.14 and 41.37 respectively). Dermal cells with a positive reactivity for PCNA were found in large numbers in radiated skin (C 8.85, RAD 13.57, RADL 30.43). Only estrogen treatment (UVB/est) brought the number down to baseline level (8.95). The other three treatments did not seem to be effective. High numbers persisted following peptide and retinoic acid administration (UVB/pept and UVB/ra: 13.29 and 17.29 respectively). Antioxidant treatment (UVB/ao) enhanced the proliferation of PCNA-positive dermal cells (38.9) [F 44.47, P 2.27E-18]. Dermal cysts (Figure 5) proliferated during 8 weeks of UV exposure, and the number went down in radiated animals held for recovery (C 4.72, RAD 6.85, and RADL 3.82). The effect of peptide cream (UVB/pept) was maximal reversal (3.23) followed by retinoic acid (UVB/ra, 4.79), antioxidant (UVB/ao, 5.15), and estrogen (UVB/est, 5.26) [F 3.62, P .004]. Photoaging changes in human skin from chronic sun exposure develop over decades, and systemic investigation cannot be easily achieved on the safety and efficacy of cosmeceuticals in human subjects. Mouse models like the hm afford convenience in probing the effect of topical agents in relation to UV-induced connective tissue damage, since the skin of such models recapitulate some key anatomic and molecular responses noted in human skin during UV exposure10. Pioneering studies by Kligman and associates11,12 have established the hm as a suitable model for photoaging. Their studies on the effect of chronic UV radiation were mostly conducted after 30 weeks of intense radiation resulting in severe photodamage; UVB radiation for 10 weeks produced mild connective tissue damage. The authors’ study involved a shorter 8-week UV exposure, and yet produced many comparable histopathologic sequelae, such as changes in collagen staining, proliferation of elastic fibers, mast cells, and dermal cysts. Elastic fiber accumulation, and collagen degradation are prominent hallmarks in photodamaged skin, and hypocollagenesis is a predictor of photoaging in human skin13, 14. The reduction in ratio of upper dermis (upper dermis/total dermis) noted in this experiment in radiated animals signifying a probable loss of collagen has not been described in radiated hm. The area in the hm upper dermis is described as a subepidermal region of newly deposited collagen, and has been described as a repair zone15–17. Damage to collagen in irradiated animals in the present experiment is borne out by the loss in immunohistochemical staining of collagen I in the radiated skin. Curiously, UVB irradiation induced no changes in total collagen or type I and type III collagens after 10 weeks of exposure to UV radiation in the hm18. However, electron microscopic studies have shown damage to mature collagen in the upper half of the dermis with bundles in disarray in animals irradiated for 30 weeks19. A loss of collagen in the upper dermis from hm skin UV-irradiated for 8 weeks has been illustrated20. Qualitative observation on reduced immunostaining of type I procollagen in UV-radiated hm skin has also been reported21. 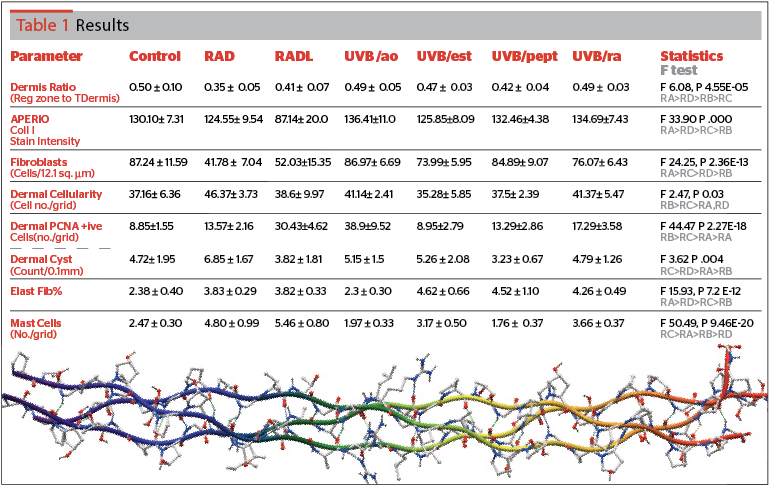 Digital analysis of collagen I in immunostained skin from UV-radiated hm as performed in the present report has not previously been undertaken. Degradation of collagen proteins by UV is apparently induced by the expression of matrix metalloproteinases (MMPs) as observed experimentally in cultured human dermal fibroblasts22,23. The numerical loss in fibroblasts in the radiated skin in the authors’ experiment is plausibly related to the depression in collagen synthesis as well as increases in its degradation. Human skin fibroblasts decrease after UVB irradiation23, 24. In photodamaged human skin a downregulation of collagen synthesis, damaged collagen, and the dermal matrix affects fibroblast function; fragmented collagen does not support tension on fibroblasts and the cell collapses25. It has been proposed that in aged and photoaged skin collagen degradation produces an environment that does not support some degree of mechanical tension necessary for collagen synthesis. This has been shown from morphological, ultrastructural, and in vitro studies25. exposure causes induction of matrix metalloproteinases, collagen degradation, and downregulation of collagen receptors on dermal fibroblasts27. The inhibited expression of collagen I, numerically reduced fibroblasts, and proliferation of dermal epithelial cells appear to be manifestations of damage to collagen metabolism in photoaged mouse skin of the present study. In the present study, expression of collagen I immunostaining was restored to control levels following treatment with topical antioxidant, and retinoic acid preparations, and a lesser effect was noted in peptide-treated animals. A similar trend was noted in respect to the dermis ratio i.e., improvements were best seen in antioxidant/retinoic acid groups. Fibroblast cell numbers were revived to a normal level by antioxidant treatment (UVB/ao group) followed by peptide treatment (UVB/pept group). It can be speculated that the morphological indices of collagen damage (i.e., collagen I immunostaining, fibroblast number, and dermis ratio) were best revived post-radiation by the antioxidant mixture, retinoic acid, and peptide cream. Under the present experimental condition involving mild dermal injury in the hm these three cosmeceutical agents were comparably efficient in repairing the dermal matrix. The other important feature of photoaged hm skin is elastosis, which has been abundantly reported following acute and chronic conditions of UV exposure. 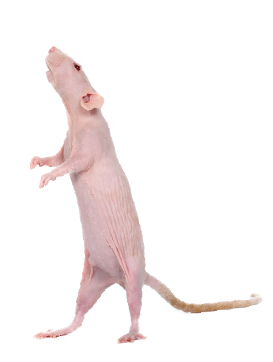 Elastogenesis in skin as a predominant effect of chronic UVB exposure occurs not only in human skin, but also in hairless mice28. Elastosis in hm can be produced after 25 to 30 weeks of UV exposure29, 30. After 25 weeks of UVB exposure the hm showed an increase in elastin content, which was due to the increased proliferation of dermal elastic fibers, and an increase in the size and number of dermal cysts was also reported30. A single treatment with UVB also leads to accumulation of elastic fibers in a dose-related fashion31. The present experiment with chronic exposure to UVB revealed a similar response in respect to elastic fibers, although the authors’ experiment was for a shorter duration (8 weeks). 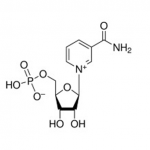 A reversal of this hyperproliferative response back to control levels was caused only by the antioxidant preparation. Notably, the other cosmeceuticals (estrogen, peptide, and retinoic acid) did not cause a reversal of this parameter, and rather augmented the values noted in radiated animals. The proliferation of mast cells caused by irradiation was brought down by peptide and antioxidant preparations. A relatively modest effect (i.e., lower than in radiated groups) was observed following estrogen and retinoic acid treatments. In summary, when comparing relative efficacy of the four commercially available cosmeceuticals in reversing the dermal damaging effects of UVB radiation in this laboratory model, the antioxidant (UVB/ao group) seemed to elicit overall the most prominent effect of reparation in respect to dermal ratio, collagen I staining intensity, fibroblast cell count, and elastic fiber quantity. Retinoic acid afforded the next best reversal of altered dermal parameters (regeneration zone ratio, collagen staining, and elastic fibers). Peptide and estrogen cream produced noticeable effects on the remaining morphological parameters of dermal response (dermal cell proliferation, follicles, and mast cells). Experimental studies are contradictory about the protective effects of estrogen against photoaging. In postmenopausal women with skin damaged by sunlight, estrogen cannot stimulate collagen protection in these areas, however, the hormone did facilitate collagen production in sun protected areas32. Among rodents, estrogen has been shown to exert protection against photoaging in ovariectomized rats33. Estrogen treatment was noted to protect the photoaged dermal matrix by the release of epidermal growth factors from human keratinocytes34. 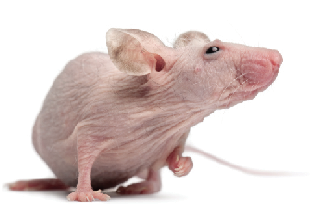 On the contrary, experiments by Yoon et al.,35 on UV-induced inflammation and photoaging in hairless mice suggest that estrogen treatment may not be a suitable strategy for the treatment of photoaging. Antioxidants and vitamin C containing products are included in many topical preparations as important ingredients, which may afford photoprotection, and reduce damage due to photoaging36, 37. 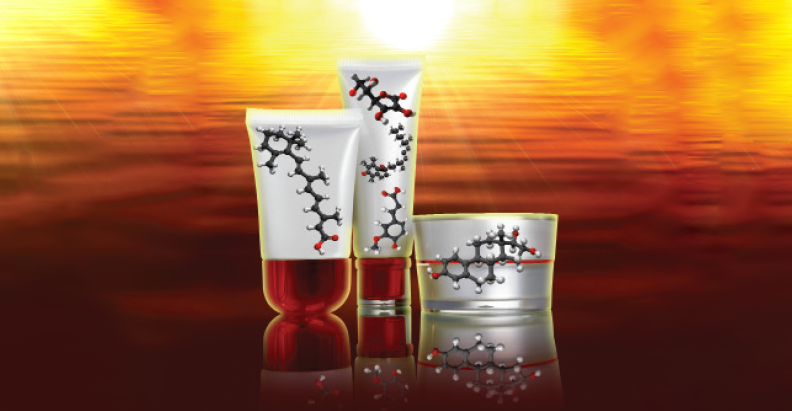 An antioxidant mixture of vitamin C, ferulic acid, and phloretin attenuated harmful effects of UV radiation in human volunteers using biomarkers of skin damage38. Elsewhere we have documented the response of the epidermal morphology from animals belonging to the present experiment. 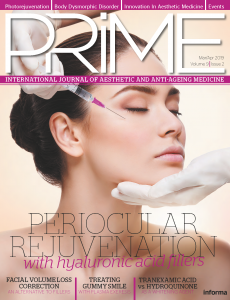 UV-induced wrinkle formation was attenuated after topical treatment with peptide cream and antioxidant mixture39. The present experiment will provide further impetus to analyze and compare histopathological changes of the UV exposed dermal matrix subjected to topical treatment with the newer family of cosmeceutical products that are emerging every day. It should be cautioned that extrapolation of rodent data to human situations would be unwise and has many limitations40. Nevertheless, it is hoped that this report will be of interest to readers involved in experimentation, or practical use of commonly used cosmeceutical products for the beautification of facial skin. This research was supported by the Bernstein grant from the American Academy of Facial Plastic and Reconstructive Surgery Foundation. The statistical advice of Professor Minu Patel of the School of Nursing, Biostatistics and Bio-Behavioural Science Department, UIC is greatly appreciated.